It's probably not recommended to read a series last to first, but that's how I'm doing the Annie Seymour series! 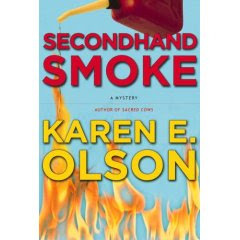 Secondhand Smoke is the second in Karen Olson's mystery series. Annie wakes up in the middle of the night to the smell of smoke. A neighbourhood landmark, the Italian restaurant Prego, is in flames with little hope of salvaging. Annie switches into reporter mode and finds out a body was discovered in the rubble. And the owner is missing. Sensing there is a lot more to this story than the tight lipped community is letting on, Annie makes enemies in her own home. When her father, a man with 'connections', returns to New Haven, Annie finds herself under the scrutiny of the police, the FBI and the mob. Still, she can't let a good story slip away. Who's body was in the fire? Where is the owner? And what's the deal with the chickens? Annie is still quite a character. A tough cookie who can't back down, even when threatened. I thought it was very interesting that Annie is such an outsider in her community. It's not really all that surprising but was interesting to see how she handled it. Things that are common knowledge are news to her. This is very frustrating for a reporter like herself. I found myself annoyed with all the neighbourhood Mama's that get between Annie and Vinny. Like Vinny could marry a girl like Rosie! Argh! I wanted to give him a kick in the pants too. I really did enjoy Secondhand Smoke with it's twists and turns but liked Dead of the Day even more. That just shows that the series is getting better and better, as a series should. (Again, a reason to read a series in the correct order). 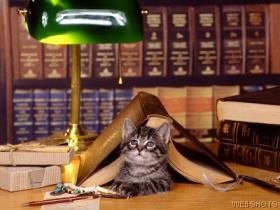 Remember, tomorrow Karen E Olson is my guest blogger as she tours her way around the blogging world.